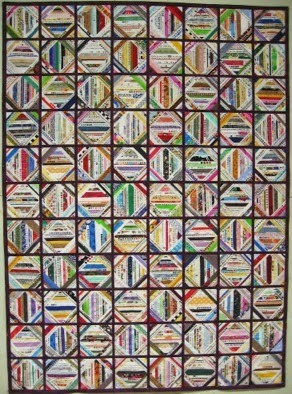 This amazing selvage quilt is the work of Ellen Hart of Winston-Salem, North Carolina. It measures 53" x 73." Isn't it a beauty? I like all the color. And the narrow black sashing. Ellen hasn't named this quilt yet. Do you have any suggestions for her? Railroad Crossing, Railroad Ties. Something about the stripes made by the selvages, and the diamond shapes made makes me think of this. Thanks for the ideas. Naming a quilt to make the label is always hard for me. The thin sashing is actually a deep purple (my favorite color), but looks black in the photo. Something made me think of sliced somethings in cupcake papers. This is amazing work and I love the thin dark purple sashing. Well done to Helen. Selvage Boxes. Very clever blocks and very clever setting. I really like this quilt. Sorry not name come to my mind. Love the looks of this. Reminds me of how a diamond looks. Maybe " facets"? Or, perhaps because of the colors melding together " prism" pr " prismatic" ? Hope you'll update us on the name. Thanks for the comments. I like "facets" too but it makes me think of facet joints in the spine (medical career). What do you think about "Selvage Stash"? or "Simply Selvage"? Love this quilt. Name? Meet Me at the Corner. I love the first one, Read My Stash! Regarding the name, I think I will take the suggestions "Read My Stash". I will be entering it in my guild's show in the Spring. Thanks for all the suggestions.